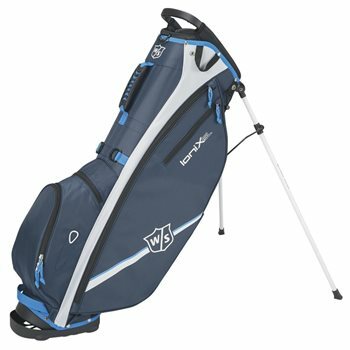 The Wilson Staff Ionix SL carry bag is the most simplified option in the Wilson Staff line. Weighing just 3.6 pounds, the bag caters to the ultimate walker demanding a comfortable feel and a quick activating stand. It features a five-way top with three full-length dividers for club organization and protection, a rubber handle for convenient demounting off the shoulders, a four-point ergonomic double strap for a comfortable backpack fit and a unique base that matches the top’s dimension to produce a stay-flat system. The Staff Ionix SL carry bag is equipped with a mesh sleeve, umbrella holder, Velcro glove patch, towel ring, rain hood and 6 pockets. Pockets included are one full-length garment, one valuables with rain repellent zipper, two large accessories, one large ball and 1 large open pocket.